News of a baby is so exciting it’s almost impossible to keep to oneself. But pregnancy is a very complicated period of life. Things happen that aren’t always happy. Couples who have experienced pregnancy loss learn to keep mum on the subject until weeks or even months into the next pregnancy. Women may share the heartbreak of losing a baby with a select few but men are less likely to share their thoughts and feelings with anyone when this happens. Mark Zuckerberg, founder, and CEO of Faceboo, may be the champion of sharing, though he’s a rather private person himself. In an uncharacteristically public move, Zuckerberg, 31, posted to his Facebook page on July 31 a photo of himself with his arm around the waist of his wife, Priscilla Chan, 30, with their distinctive-looking dog, Beast, at their feet. The family photo leads off a pregnancy announcement. 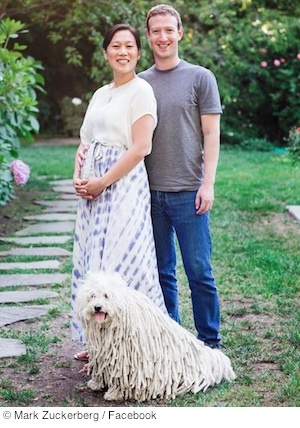 The Zuckerberg-Chans are expecting a baby girl. Zuckerberg and Chan met while both were attending Harvard University in the days Facebook was founded and were married in 2012, shortly after she graduated from the University of California, San Francisco, School of Medicine with plans to become a pediatrician. When the couple shared the news of miscarriage to their close circle of confidants, they were surprised to learn how common miscarriage is and how reluctant people are to discuss it. Anna Almendrala, a Healthy Living Editor at The Huffington Post, offered thanks to the couple for “sharing about pregnancy loss” in a post published on August 3. In the post, she recounts the turmoil she and her husband experienced when telling people the pregnancy they were so excited about was no more. “Miscarriages aren’t shameful secrets,” she writes. Aaron Gouveia, writing for TIME Magazine, says “more men need to talk about miscarriage” and thanks Zuckerberg for voluntarily sharing his emotional insights with the world. “For helping all fathers.” Gouveia and his wife have three children, born within a seven-year span that also included five pregnancy losses. As for his daughter, Zuckerberg is convinced she already takes after daddy. In a recent ultrasound, the baby seemed to be giving a thumbs-up sign, just like the “like” icon used so often in the over-sharing world of Facebook. Zuckerberg, Mark.“ Mark Zuckerberg.” Facebook.com. 31 Jul. 2015. Web. 3 Aug. 2015. Almendrala, Anna. "Thank You, Mark and Priscilla, for Sharing About Pregnancy Loss." HuffPost Healthy Living. TheHuffingtonPost.com, Inc , 3 Aug. 2015. Web. 3 Aug. 2015. Gouveia, Aaron. "More Men Need to Talk About Miscarriage." TIME. TIME Inc. Network, July 2015. Web. 3 Aug. 2015.